In 2017 the Vietnamese government has launched the new E-VISA service. An E-VISA is an electronic visa that you order online and receive by email. You print it out and bring with you to Vietnam. At the Vietnamese border you show your E-VISA and passport. You will then be allowed entry into Vietnam. • The E-VISA is valid for 1 month, single entry only. When you leave Vietnam the e-visa expires. • You will need to select which border crossing, sea port or airport you will arrive. Please check the E-VISA border list for the list you can choose from. The great advantages of the E-VISA are that you don't have to visit the Vietnamese consulate, and in Vietnam you can go straight through customs. Are you not in the E-VISA countries list, and do you arrive by airplane? Or, are you looking for a 3 months or multiple entry visa? ⇒ Then please please apply for a visa on arrival. The price of an E-VISA is very competitive, similar or lower than at the Vietnamese consulate. ⇒ For RUSH visa, 2 working days delivery time, the additional fee is 20 US$. 2. You have not visited Vietnam without visa in the month before. You know at which border gate you will arrive. Your passport is valid for at least 6 months after arrival date in Vietnam. You need a digital photograph of your face in JPG or PNG format. Face straight. This needs to be uploaded during your visa application. 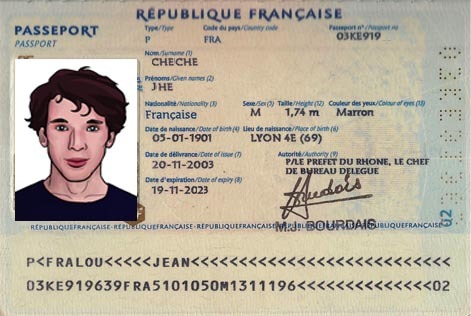 You need a digital image of your passport page in JPG or PNG format. The border of the page must be visible. All text must be readable. This needs to be uploaded during your visa application. Please select the purpose of your visit. Visiting family? → Please select "visiting relatives"
Your visa will be valid for 1 month from the start date you choose. During this period you may arrive in Vietnam at any day you like. So you are allowed to arrive later than your visa start date. You are not allowed to arrive earlier than the visa start date. The delivery date and time of the E-VISA by email is mentioned on the website. You will receive the E-VISA at this time or shortly before. Visa are only issued during opening hours of the Vietnamese immigration office: Monday till Friday, from 08:00-11:30, 13:30-16:00pm (Vietnam time). Last order is taken 1 hour before closing time. Orders after that time will be processed the next working day. If you arrive at another border gate then entry to Vietnam may be refused! Please select the border gate where you expect to exit Vietnam. Not sure? That's no problem. You will be allowed to exit Vietnam at any border gate. Please mention the hotel or address where you intend to stay the 1st night in Vietnam. Not sure? No problem. It will not be checked. Just mention any hotel near the place where you intend to stay. Please select the city/province where you will stay the 1st night in Vietnam. Not sure? Not sure? Please select "don't know" at the bottom of the list. We will then select the right City/Province for you. 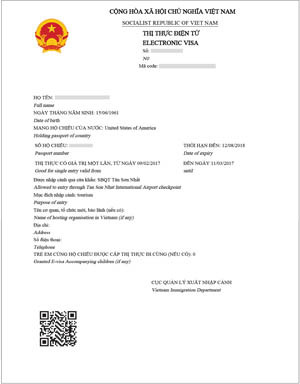 E-VISA for Vietnam is a service provided by the Vietnamese government whereby your visa will be issued electronically and sent to you by email. It is an alternative for collecting your visa at the Vietnamese consulate. • Easy website for ordering. • Map of Vietnam with all border gates suitable for e-visa. • Expedited e-visa delivery within 2 working days. For our services we charge a service fee . The price of an E-VISA is often lower than at the consulate. For reference: the price of a one-month single entry visa at the Vietnamese consulate in the United Kingdom is 55 GBP (approx. 72 US$). With E-VISA you pay 59 US$.